Displaying a common scene most probably from Isfahan also spelled Esfahan; this Persian rug pops out for having a particular theme and because of its extraordinary color scheme and details. From the entire landscape down to buildings and people everything is full of descriptive details and specific features inspired by local life-style and habits. This scenery is framed by a three border scheme decorated with Shah Abbasi motifs. Its silk foundation and wool pile adds quality both to its design and durability. Details abundance is also guaranteed by its knots per inch density of 550. 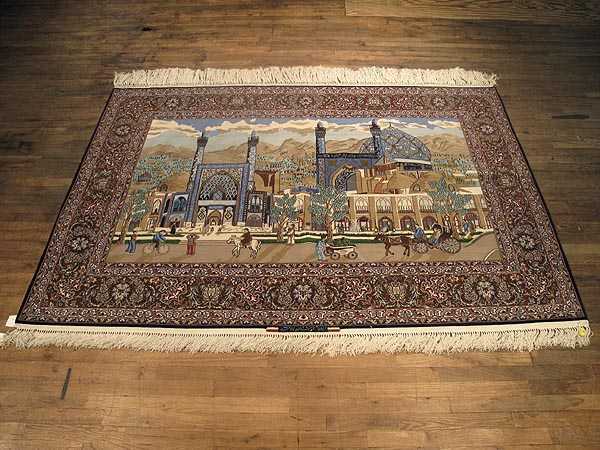 This Persian rug is best used for a more decorative purpose like wall hanging. The most suitable design style for this Persian rug is an Oriental based style.